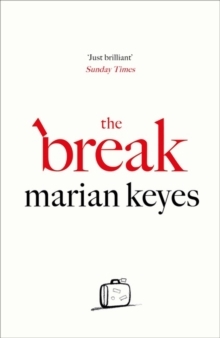 The Break is the latest novel by the phenomenally successful Marian Keyes. Earlier this year I reviewed one of her previous books, The Mystery of Mercy Close and wrote about what genre I think her work fits into, so I won't cover that again here. Narrator Amy divides her time between Dublin and London, where she is a partner in a small PR firm that just about keeps its head above water. She has two daughters, 22-year-old Neeve from her disastrous first marriage when Amy was barely more than a child herself, and 16-year-old Kiara from her current marriage to Hugh. Amy and Hugh also care for Sofie, their fragile 17-year-old niece. Amy's relationship with Hugh has been largely harmonious - until one day Hugh, struggling with depression after the death of his beloved father, announces the devastating news that he would like a break from being married. Hugh's plan is to go travelling in the far east for six months, during which time he'll be an entirely free agent. And of course, this means Amy is suddenly a free agent too. Will Hugh want to return when his six months are up? And more importantly, will want to take him back? The Break is an extremely funny novel - I laughed out loud several times - and is full of well-observed details and asides that certainly ring true. Marian Keyes writes with a great deal of warmth and charm and there are some fantastic comic creations among the characters, yet none of them are so much larger than life that you can't believe in them. As with the The Mystery of Mercy Close, there are also serious points to be made. Amy's pain as she faces up to the end of her marriage feels very real indeed and there is a true poignancy there that shows a real understanding of the complex nuances of long-term relationships. A subplot that deals with the appalling plight of women in Ireland facing unwanted pregnancies actually moved me to tears* and the author's entirely justified anger at this shocking state of affairs practically crackles off the page. The complicated relationships between Amy and her family and friends are well-constructed and realistic as well as making me chuckle throughout. Many of the characters - including Amy herself - sometimes make poor choices, and are all the more credible for it. Nothing about Amy and Hugh's situation is black and white and the moral dilemmas Amy faces are far from clear-cut. In short, this is a very perceptive novel which combines astute and often moving observations about love and relationships with comedy and a page-turning plot. The Break is great fun and I raced through it in a couple of sittings despite its high word count. Thank you to Penguin Books for sending me an advance copy via NetGalley to review. The Break is published on 7 September.